With over 2,000,000 downloads, Ship Mate is the undisputed leader in mobile cruise apps. Ship Mate gives users access to reviews, tips, roll calls, and cruise countdowns, but the best part is that many of its features can be used offline. Once you punch in your sailing, you can find your way around the ship with deck plans, learn about all the onboard entertainment and dining, and even get info about the ports you'll be visiting, all without using a single byte of data or racking up roaming charges. If you do purchase a Wi-Fi package (step 3), you'll have access to the app's full list of features, including direct messaging (which you can use instead of texting) and thousands of user photos and tips. Ship Mate is available for iOS and Android devices. 2. Check what your cell phone provider offers. 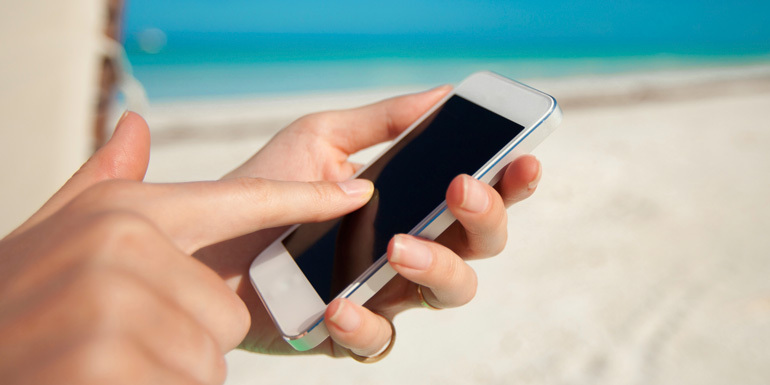 Major wireless providers have a cruise ship plan with lower rates than regular roaming rates. Contact your provider to sign up for the plan before you depart. Wireless carriers offer data, messaging, and calling plans for cruise ships that are similar to on-land packages, so you can pick the one that best suits your needs. See cruise plans and pricing for AT&T, Sprint, T-Mobile, and Verizon. 3. Consider buying a Wi-Fi package onboard. How much does internet cost on cruise ships? Since cruise ship internet is getting faster every day, it may be a better choice than a wireless plan for cruisers who want access to social media and email on the ship. See how much your cruise line charges for an internet package. 4. Know how to post to social media via text. You can Tweet by sending texts to your Twitter account, which — depending on your Twitter habits — may be cheaper than a data plan. Just text “start” to 40404 and follow the instructions. Once finished, you can text your Tweet to the 40404 shortcode, and it will post to your Twitter account, no Internet needed. Facebook has a similar feature, allowing you to text your updates to a shortcode. These rates are a general overview, and prices may change for certain ships, ports, or devices. Remember that if you buy the cruise ship plan from your wireless provider, those rates only apply when you’re in international waters. Once you’re within 12 miles of a port, the roaming rates for that country apply. Updated on May 3, 2018. Do you completely unplug on your cruise? We paid $40 for an international package. That was just on my husbands phone and it allowed us unlimited incoming texts and 100 outgoing. We also had 100 min talk time and 10 gb data. We didn't use most of that but it was peace of mind for us. We left 2 dogs and 1 cat at home and we also have cattle that were calving so we were able to receive daily updates from our farm hand and from the people taking care of our animals. We just told our carrier what ship we would be sailing on and on what dates and they set it up. buy the wifi plan, bring a little wireless gateway/bridge/extender like one by tripmate to rebroadcast signal to other devices. turn airplane mode on, but wifi on. dowload google voice, it can send AND receive texts using wifi. use skype or google voice to make calls. this worked well on disney as their wifi is good and strong, less so on carnival. T-Mobile has unlimited Data and Texting in most ports for free if you have the simple choice plan. We have 6 ports on our next cruise and Belize is the only port that I won't have service. LOVE T-Mobile! My husband left his phone off for the most part. He only turned it on when we went back to the room and I was cleaning up or something. I know it isn't exactly like carrying on you at all times, but that was kind of nice. We, after all, did go to our room several times through the day. CruisinTim, Airplane mode is the way to go. Once you activate Airplane mode, you can manually turn wifi back on, which will likely be necessary to access the Princess app. No internet connection is required for offline Ship Mate app use. If you don't go into airplane mode and leave cellular data on, there's always at least a small risk that you'll incur data roaming charges. Ok so here's a question....I am planing on using my cell aboard the ship but only for the offline Shipmate app. We will be sailing on the Caribbean Princess and they have their own, free offline app that is kind of like a mobile copy of the "Patter". Now, when I board, should I put the phone in "Airplane Mode", turn off "WiFi" or both? Remember the local businesses that offer wifi and phone services. Recent visit in Nassau, Bahamas has local business at the port offering plan starting at 20 min for only $2.00...much more affordable than carrier or ship charges. Learn to relax without communications when at sea! If an emergency comes up, make arrangements with cruise line for being notified before you leave on your trip. Many lines have ways for you to be contacted by family during an emergency. Thanks for sharing these helpful tips deaniam2! Using walkie-talkies is certainly becoming a popular workaround for no cell phone service at sea. We take a phone for extreme emergencies. We are on vacation and do not want to stay in tune with every little thing from back home. We can catch up with the normal stuff after debarkation. Key is to have texts sent with lots of info on each text. Texts are $.50 each but no limit on the length. |Many are $.15 to receive and $.50 to send. Your phone carrier can help set up your phone to ensure you are not going to access international internet. Your phone may do it automatically if not set up to stop it. My wife goes into airplane mode and uses her phone for a camera I keep mine for a camera and once or twice a day to see if I have any texts. Take a pair of walki-talkies for onboard and on island communications with each other or with your group. Talking is free on them..
You can use Facebook messenger and make phone to phone calls using messenger. It uses WiFI so not minutes are consumed if you purchased a WiFI plan. I did on my last cruise and it was a great. Never thought about cell phone charges while on a ship. Great info, need to discuss with my carrier. Really glad I followed up with my carrier, AT&T, for $10 a 24 hr period you can use your phone as usual without additional costs in the ports. I am planning to take a river cruise sometime next year and just reading all the suggestions given by all these people is helpful. Be very careful with having your cell phone on while on the ship. It can be very expensive with the charges if you are not familiar with the internet package and how it works!